Wrong beliefs sabotage sincere leaders. Sincerity doesn’t compensate for ignorance. Sincere people adopt beliefs and practices that block success. Everyone does. With time and reflection you learn and adapt, or you crash. Leaders are in positions of power. If you can’t measure it. it doesn’t matter. Leaders are in postitions of responsibility and service. “Now that you have power, don’t ever use it. Great leaders are great because people trust them, not because they have power.” Admiral Theodore Blanchard. What really matters is why and how people achieve results. It’s silly to say results don’t matter. It’s wise focus to on purpose. False beliefs are dangerous because they connect us with suboptimal motivations. Money motivates to a point, but optimal motivation goes deeper. Everyone is motivated. Successful leaders help people find optimal motivation. Help individuals align to work-related values. Provide an honest assessment of skills. Invite choice. Explore options within boundaries. What faulty beliefs about leadership have you modified or rejected? How might leaders help people find optimal motivation? *This post is based on my conversation with Susan Fowler and her new book. Book Give away is complete. I’m glad to see the “It’s not personal listed. While some do go overboard with taking it personally, the quality of work and the effort put into doing a job well done does take a personal commitment level. Strong commitment, even belief in a corporate mission can make it peronsal in the best sense of the word. Great point, TerriLynn, I would add that there is a need for effective leaders and employees to recognize that an organization mission may be emotionally provocative and as such may enhance one’ work experience or provide the motivation to work for a particular organization at all, however, there must be a convention of being a bit thick skinned so that a truly honest flow of ideas and problem solving and innovation can occur. How refreshing! This helps others to put back the personal face American business has been losing over the last couple of decades. Bravo! Great post. I woud add to #1, help those you lead to remember why you do what you do. There is so much value in the why. They why never changes, the what and how might but he values stay the same. Business is personal. Too often leaders are not aware of their emotions and their significance. Susan is on target with her comments on leadership! How do you find the optimal level of motivation that is sustainable? What are the signs of too little or too much? I like the phrase, “The nature of human motivation is not about making money. The nature of human motivation is in making meaning.” I consciously chose to work for a not-for-profit agency as I believe in their mission and that I could make a difference. My IT skills are transferable to many organizations, but of the mission doesn’t have meaning, neither does my work. I like how these things are intertwined. For example, bad cultures happen when organizations forget they serve and leaders don’t understand they leaders are in a position of responsibility and service. When these two failures happen, extraordinarily bad things can happen. A number of different examples come to mind. In the late 1990s a Korean Air Line crashed into a mountainside even though the flight engineer and co-pilot were aware they were about to. They deferred to the pilot who rigidly clung to a belief he was right. 228 people died. In the 2008 credit crisis, financial firms forgot some basic principles, such as don’t lend money to people who can’t afford it. In one example, a California couple was approved for a mortgage with a monthly balloon payment larger than their current combined income. Finally, at Penn State, the revered JoePa forgot he was not meant to be revered! If we forget these important tenets, the outcomes are far more critical than we have unhappy and unproductive teams. In many cases, people can be injured (mentally and physically) or lose their lives. As such, it is important to remember that leadership isn’t just given; it’s accepted. If you want to be a leader you must be prepared to lead! I’d welcome an insight how #2 would reflect falsely for those of us working in the public sector, obviously money isn’t the only thing anywhere. Clearly, everything is personal, it’s to what degree. Public sector challenges are the toughest with the measurement…what *really* counts. “Business is personal.” This is shifting my perspective, and I’ve used the reverse statement as a crutch. But business really is about relationship and relationship has to have a personal connection (with boundaries but still personal). Hmm. My wheels are turning and some assumptions are being challenged. Thanks Dan and Susan! Thanks Jessica. I’m thankful for your transparency. Best wishes for the journey. I am absolutely guilty of #5. Being in charge of operations everything we do must be measurable. It will take some dedicated effort to change this. Wow….I read “Don’t fire them….Fire them up” a few years ago and had difficulty implementing the techniques they described. Everybody is different and passion levels for the work vary at every level of the company. It’s refreshing to see in black and white that even the things that can’t be measured are important too….and many times, I believe they are more important that the ones that can be measured. I truly enjoy the perspectives of your posts and replies. I am constantly amazed how much I learn from these posts. I have been in my industry for over 30 years and management for most of that time and i know I still have much to learn. I tend to treat my team like extended family at times to a fault perhaps so every performance review impacts me as much as the team member – maybe more. It is definitely personal to me. Thank you! I enjoyed this topic today. I appreciate the help in the area of motivation. I used to believe in all 5 of those. Over the years and by educating myself on leadership I have been able to retrain my behavior. I especially agree with the first one. Anything and everything related to business and leading is personal. There is no business if you cant connect to others on a personal level. Thanks for reinforcing these important concepts. It`s amazing to me how many people try to motivate with coercion. I`ve really connected with the idea that leaders are in a position to serve. So often, people think just the opposite. But when I`ve been in leadership positions, I`ve found that when I take that approach that my job is to help ensure that everyone else is supported and their perspectives are valued, the team of people I work with become very engaged and go far above and beyond what I ever expected. Those conversations that create a common vision of what we are trying to achieve, and how we can best get there are key. I would love to read the book, we all need motivated sometime or another. I find item 5 in the Finding optimal motivation: section most effective in my environment. Having a part of how things move forward is key for several personalities on my team. There are some great ideas to explore here. I would like to dig deeper into the book. Amazing point Dr. Gupta. That motivation is transactional…..there must be an efficient method of merging goals….survival of Individuals in need of a paycheck and work satisfaction, survival of an organization including its mission and obvious attention to the proverbial bottom line, and survival of leaders who may genuinely want to encourage employees to contribute to the organization and its methods of achieving its goals but also need their own paycheck. This may be where I feel that personal ego is misplaced in business….achievement for status sake and mistreatment of others is meant for the therapist office not an organization that needs to persist, and the same goes for emotional employees that internalize feelings of rejection or reprisal during the process of meeting organization goals. Possibly one dominant reason “Why motivating people does not work” could be organisational leaders treat employees as asset. We have much progressed in theory but lagged in executing those theories. Organisations still follow the same old practices of treating human as an asset. They have false believe that as long as you can extract people, extract it. There are many people in pipeline as a substitute. This practice is deep rooted and often self centric in nature. People in power try to create environment of being concerned for the company and get full advantages of their position as long as they are in power. They make clear strategy to show their concern. They also know that after particular period, they may leave the company. So, why to bother what will happen later on. Even if, they are exposed later on, it hardly impact them. And this is the faculty belief of leaders and organisational practices. As long as organisational leaders belief in such practices, more powerful people support it. They justify as well by their results. And this is the main reason why motivation does not work. It is one sided and perhaps top-down. So, people work to save their position. They work for survival. And Leaders often treat employee effort as motivation. Motivation which is transactional and take care of all stakeholders is important, but it hardly happens. I agree with you that it is trust that motivate people, not the people in power. Wow. These concepts really resonate with me. I’m glad someone has the courage and wisdom to write them. This is a book I WANT to read. I’m an educator. My job is to teach AND inspire young people. Recently a woman said to me, “I would be willing to vote for the school levy if schools were run more like a business.” And yet charter schools are struggling and going out of “business” too. Too often we define business in dollar signs. It bothers me that great teachers are leaving the profession in herds. In the education field our business is teaching and learning. Our business is challenging and inspiring young people. Our business is helping them discover and grow their talents. The greatest teachers teach about the value of change and adaptation. Our “business” is first and foremost personal. I think one of the key faulty beliefs that I have encountered is “If he/she’s in power, he/she must have an agenda.” I have seen much misery erupt from this one on both sides of the equation. The five common beliefs above are really powerful topics. Perhaps you could devote a day to each one of them. Lot’s ‘o gold in them thar hills. I believe that what the company for which I work does is important and truly helps people, but we don’t do it for free. If you give your time away it is Charity. Businesses make money. If businesses don’t make money they don’t continue to be businesses: they have to lay off all of their employees and close their doors. There is no doubt in my mind that the most powerful motivator is purposeful meaning. People will do almost anything when they have purposeful meaning. Mother Theresa and Gandhi come to mind. Interesting perspective. As a school leader, I often tell myself not to take things personally, but in reality I put my heart and soul into my career and should acknowledge the personal feelings that accompany it. As a “touchy feely” type in my organization, it is GREAT to read, “The most rewarding aspects of work are those most difficult to measure.” by Susan Fowler In my environment, too often I see leaders that have completely closed off (shut down?) their personal side because they are focusing on the wrong things. I say it is time for more honest, brave and vulnerable conversations. I look forward to reading this book! I couldn’t agree more regarding it being personal. We all react personally to everything in our lives, whether it is business or otherwise. To deny that is to deny that we are human with the expected adverse results. The PURPOSE of business is to serve. Servant leaders understand the reason they are in the position–to serve. Those who can’t get on board with that idea will often struggle in their “leadership” role. Thanks for the articles. They are valuable. Great post! Way too often are the relation aspects of leadership overlooked. Leaders should be pouring themselves into the people who will be their successors. Always enjoy the perspectives you present Dan. Good day! I love the quote, “The most rewarding aspects of work are those most difficult to measure.” Susan Fowler, because this is incredibly true!! I really like the adaptation that says if it’s really important it’s probably not measurable! Relationships matter! Additionally when the focus is on making money instead attending to relationships, improvement, etc., we often fail to achieve the outcomes that we desire. When I coached track, those who focused on how many medals they won rarely improved. Those who heeded the coach’s advice and focused on their own improvement and helping each other improve, found personal pride and satisfaction in not only the improvement shown, but in the number of medals won as well as a result of the improvement! For so long, the focus has been on the ‘science’ side of leadership…the hard data….the bottom line. Finally, someone with the courage to acknowledge the ‘art’ of leadership…the non-measurable aspects that are often what makes a great leader. Servant leadership, the leadership that flows out of sound character [try measuring character from a resume], creates the environment in which those led thrive. That leads to all the measures of success. Thanks for the post! This is a very interesting topic for me. I work in government where motivation is difficult. There are no raises for producing good numbers and obtaining satisfaction by completing a project is non-existent. Many times I focus on numbers which makes me at fault to #5 and since we place our lives in the hands of our teammates when it comes to discipline we routinely fall back on #1 to ease the pain. I have always been told I need to motivate my people more but believed there was a different way. Glad to see some literature on this subject, can’t wait to read through it. This post hits the mark. Especially the comment on the importance of even those things that cannot be measured. I look forward to reading Ms. Fowlers book. This post really resonated with me, particularly #s 1 and 2. My work revolves around engagement (specifically community and volunteer engagement), and my experience with people is that motivation really is tied to making meaning. You see that so clearly as people navigate opportunities to engage as volunteers. People are drawn to what resonates with them and what has meaning for them. “5. If you can’t measure it. it doesn’t matter.” and “If you cannot measure it, it is probably really important.” My starting point is that you can measure it. While there may not be quantitative metrics for many things, there are usually qualitative metrics that allow you to “measure what you treasure”. For example, you may not be able to measure performance by saying something will be done within so many days/hours/weeks but you can measure it by saying that the performance will be “timely”, which allows assessment of performance based on the context, facts, and results of performance. Qualitative metrics may be difficult to establish but are helpful in measuring things don’t don’t easily conform to quantitative metrics. Motivation isn’t something we do to a person its something we do with them. It’s just business is usually an excuse for rude or unethical behavior. I also find it’s hard and ineffective to treat everyone the same, instead shooting to treat everyone fairly, because some people have different needs which from time to time arise. This is a great post. I hear the ideas that some people have in leadership roles and it makes me scratch my head. Great short list of things especially the leadership power mention and the results topic. This is cool! Thanks, Susan & Dan. Of importance to me is the principle that the concepts “that can’t be measured” are the grist for conversations to create mutual meaning. THAT creation and continuous conversation (e.g., about organizational values) is a meaningful & powerful element of performance, accomplishment, & success. Great words to meditate on! I would summarize it this way: Provide value to those you are leading instead of draining them to gain value for yourself. In this way you invest in people and get a much larger return on your investment (and so do they). I love this post. It’s always personal. If it’s not important to you personally – why do it? Your #3 sabotage belief is not only true, but scary how many people (including too many in leadership positions) believe it. Power and leadership can never be linked in a positive way. Never. These techniques can apply to all aspects of business and life. I served 30 years as Senior Pastor of a church and really like what Susan is saying about motivation for both the church and the secular. Extremely practical information and worthy of maximum effort in implementation in all areas of life. I agree with all the points, but especially #4 – how do you measure relationships and an individual’s ability to influence? Extremely necessary attributes for leaders. Motivation happens when a match is finally lit by that spark of light that has surfaced from the depths of soul searching. Dan, I firmly believe that in order to be a successful Leader you need to lead by example. Innovate and mentor. There is no need to show of power. A combination of all these with real pursuit of goals will automatically bring money and profit. I know of this particular leadewr who believed that things can be done only by exercising power. He created an atmosphere of fear amongst every one. People still used to do the job. Not out of love or ownership but out of obligation. Each used to drag himself to work every day. Creativity was snubbed at every stage. Result. Organisation suffered and all well meaning people left. Today he is reminiscing about his action. It is too late. The damage is done. Some inconsistency: “if you can’t measure it, it probably doesn’t matter” v “if it’s hard to measure, it’s probably v important”…in business you need to understand the kpis that drive customer contentment, profit & cash (different for every business)…and align staff incentives with meeting those kpis in a transparent & consistent manner…whilst creating a positive “can-do” culture that breeds success…easier said than done. Dan, especially like the “Adapt” points outlined here. Great post on doing the things that can make, not break, your people. Business is about relationships. Motivation comes from inside, not outside. Motivation comes from a “motive”, why you do what you do? Personally, my biggest struggle is to transmit to people (shopfloor) the why we do things, because from experience, if we focus on money, savings, scrap, etc… people doesn’t get engaged. so, how do we accomplish all this corporate goals (money, savings, scrap..) if this is no motive for shopfloor people who are at the end the real players in the game? I would add to your 5 common beliefs another one, that comes from a desperate try to engage people: “you should be self-motivated because you have a job, be thankfull that you have because there are so many others that does not”. Thanks for sharing Dan, as usual, learning a lot from you. This book looks very interesting. Susan’s point that “If it can’t be measured, it isn’t important” is so poignant. The very values that are cornerstone to many successful organizations are not quantifiable. While many organizations only want numbers, in the end they will fail. People, attitudes, and character, (among others), are so important in the workplace. Thanks for confirming for me what I have thought for some time now. I work in healthcare and the issue of ‘power-over’ is a daily struggle. ‘Walking alongside’ the patient and family has become my mantra. This post resonates with the messages in Peace and Power by Peggy L. Chin. 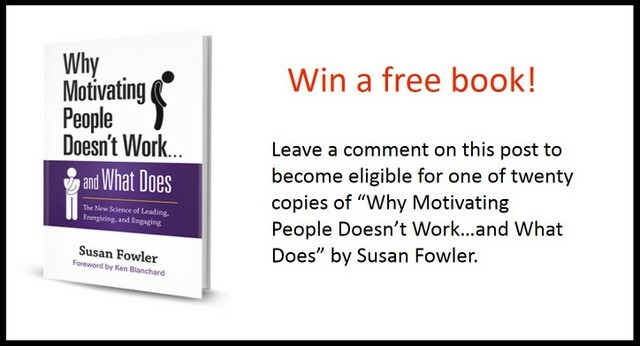 I’ve always thought what motivates people is a fascinating subject. Love the quote “The nature of human motivation is not about making money. The nature of human motivation is in making meaning.” As a long term government employee I’ve found that to be true. Most of the leaders that I have dealt with lead with the expectation that they are the “leader” and that should be sufficient for me to be lead (to the “power” point in the article). A leader must interact with others on an ever changing basis to stay out of presumption. Leading is not for the weak – nor is it it about being strong; it is all consuming! A good leader will be led by what is around him or her and respond by pulling others out of themselves in order to find solutions on multiple levels. Leading is a gift and an honor! Great post that hits home. I will be sharing this with my “motivation” team. This book looks great. Can’t wait to see it. I appreciate the comment about the really important things being those that cannot always be measured. So often I see “metrics” reported that are not very meaningful. The number of conversations a supervisor has with his or her direct reports is not very meaningful, but what is said or discussed in those conversations can make all the difference in achieving important results. The number is easy to measure, the impact of meaningful conversation is immeasurable. It’s very insightful that business IS personal. We all come to the table, so to speak, with different backgrounds, beliefs, experiences, etc., and it’s shortsighted to think that people can put all those aside when it comes to business. While I agree there are some instances you do need to put aside personal feelings and make tough calls that are based solely on business needs, not personal feelings, in those instances it’s still important to recognize and validate that others’ personal feelings are still important and were considered. Great post. Despite all of the available research, managers are still holding on to antiquated views of motivation and engagement (with disastrous results). We’ve got to turn the corner on this issue and embrace the realities of what works and what does not. As a consultant and facilitator in the nonprofit sector, this is spot-on! Using passion and purpose to motivate people (staff and volunteers alike) produces results. Great insight. Having led teams for many years, I have learned that knowing your people at a personal level goes a long way – understanding their challenges, dreams, ambitions, and aspirations, and seeing them as a whole person, not merely a resource. I have personally found asking my direct reports to tell me what inspires and motivates them lets them put it into their own words, and helps me to understand better how they perceive their environment, and me as a leader. Checking in regularly to see if there is more I can do/stop doing is also helpful. Finally, I have to demonstrate daily that I mean what I say, that I will back my team up every time, and give credit where it is due. This builds trust and credibility, which is invaluable if and when I need to have a tough conversation. I always tell my team that the minute they don’t want to get out of bed in the morning to come to work, we should talk about it, and I’ll do everything I can to support them, whether this means staying (perhaps with a role change or adjustment) or leaving the organization. Truthfully, I hate the carrots and sticks. I love that the company I work for now focuses on mission. Yes, they look at our numbers, but more than that they challenge us on our values: Do we care about the people we serve? Are we constantly learning how to serve them better? Great post and amazing reflections. I always thought that people are more important than numbers or money in a company. Our motivation will be more close to the success if we know exacly how to motivate and how to understand people who work with us. Just finished a 2 day training on “Crucial Conversations” provided by Vital Smarts. Establishing good relationships is essential & the key to “making it personal” & arriving to that “pool of Shared Meaning”. It’s the first step in establishing & maintaining relationships. I look forward to reading Ms Fowler ‘ book. What aids in keeping me sincere is working closely with my team. I recently moved my office from corporate to their floor. I work at the same desk set up as they use. They see me and hear me interact all day. I am closer to the issues they face and can help them solve problems – not by giving answers but by encouraging them to make informed decisions. I’m sharing this post with my management team. Thanks, Dan! Love your perspective on motivation. These seem like tensions we to learn to embrace. It’s so easy for leaders to get the business and miss the sacred. Bottom lines, meeting agendas, task lists…those things are important BUT the relational things are the sacred parts of the trust. In my years of leading people and developing leaders the things that have come to matter most are health, equitability, and advocacy. The things that you’ve mentioned are the things that add to the health of both institution and team member. It is the leader’s responsibility to create an environment that promotes health, allows everyone to have the proper voice and place at the table, advocates for both institution and those that depend on the leader. Thanks for helping us to think on higher plain. It’s wise focus to on purpose.